Treasury products offer end users a range of opportunities to hedge, speculate or manage risk exposure, and Shariah compliant equivalents of conventional products are no different. The structure, use and application of Islamic treasury products are, however, governed by very important rules and conventions. With Shariah compliant treasury and hedging products becoming more widespread by financial institutions for both risk hedging and for structuring client investment solutions, these rules and conventions are crucial to the development of these products. This one day, multi-speaker event will analyse and discuss what can and cannot be done, what clients are demanding, what opportunities are available and what solutions can be offered. We shall analyse these issues from the view of product structuring, as well as examining key Shariah, risk management, legal and documentary considerations. 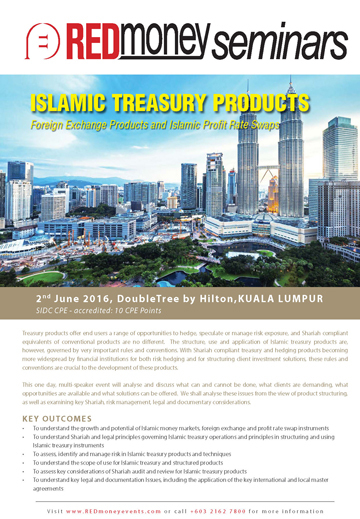 The seminar will be beneficial to anyone from treasury and money market departments of an Islamic financial institution, as well those in conventional treasury departments looking to incorporate Islamic products. It will also be highly beneficial to professionals from the following departments: legal and compliance, Shariah, finance, risk management, audit/assurance. What products are currently available, what are they used for and by whom? Lessons from the conventional market: what has worked and what hasn’t, and how far should product replication be taken?